Books can be purchased on the AmSAT website or on Amazon. Alexander Technique in the NEWS! 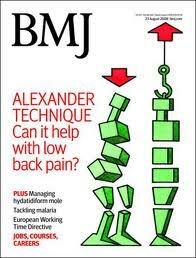 According to a study published in the British Medical Journal, “back pain is a common condition managed in primary care and one of the commonest causes of disability in Western societies.” The study concluded that lessons in the Alexander Technique along with prescribed exercise had a beneficial effect on chronic back pain. Read and listen to a story on the Morning Edition of NPR about how the Alexander Technique helps people, especially musicians, relieve back pain. American Society for the Alexander Technique (AmSAT) AmSAT has a great animation describing the Alexander Technique on their home page.